On February 9, the Vermont Department of Health announced that Vermont Yankee was leaking nuclear waste into the Connecticut river. The leak has not yet been fixed. The Vermont legislature will make history in its February 24 vote on whether to allow Vermont Yankee to continue operating after 2012. Never before has a state taken such a vote. Volunteers with the Vermont Public Interest Research Group (VPIRG), the state's biggest environmental organization, spent the summer knocking on doors and speaking with people about why Vermont Yankee should be closed. 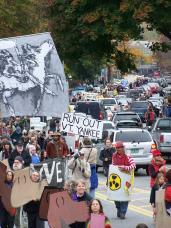 "We've been finding tremendous support for closing Vermont Yankee," said VPIRG director Paul Burns. "Because of the way the prevailing winds blow, New Hampshire would probably be most affected by an accident. So we're getting support from people in New Hampshire and Massachusetts, too." This article replaces a Feb. 16 Valley Post article about the Feb. 21 march and rally. Submitted by Anonymous on Mon, 02/22/2010 - 10:08. 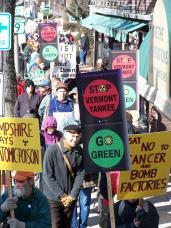 I hope that Vermont Yankee will be shut down as a nuclear plant in 2012, if not sooner for being a safety hazard. They are not running the plant in an honest or responsible manner. The fact that they lied about something having to do with how they are running the plant (the underground pipes) should, in itself, be cause for them to be shut down. Do we want a nuclear plant in our midst, being run by people who would actually lie about how they are running it? Come on. There is also the long history of frequent safety issues that they keep making excuses for and say are unimportant. Worse than the safety problems themselves is that the people running VY "defend" themselves instead of being serious about fixing and preventing the problems. Hence, I think, the high frequency and increasing severity of safety problems at the plant. The level of honesty and the level of safety are both in steep decline. We need to be rid of this problem as soon as possible. It would sad for families to have to relocate, but the public does not owe jobs to anyone. If the business you are working for is doing something outrageously unsafe, you might lose your job. That is life. Lots of people lose their jobs. They find ways to move on and make a good life. Often a better life. And these jobs are going to end anyway, it is just a matter of when. Everyone knew when they started working at VY, what the deal was. The local economy will also be OK. The loss of Vermont Yankee will open up an opportunity for local entrepreneurs in green energy and efficiency. We will have a strong econoomy... with different players. Local players. Maybe some former VY employees will be among these entrepreneurs, too. With two years notice, both the workers and the economy will have the lead time they need to make a successful adjustment. Two years is even enough time for a high school graduate to attend a local community (GCC) or technical college (Vermont Tech) and get a good amount of training in sustainable technology, or for a college graduate to attend a masters program. Perhaps some former VY workers will go back to school too. I think getting rid of VY in 2012 would make our economy stronger because it would give a big opportunity for local people to step up and be entrepreneurs. I do not think it is too soon- I think we can become a strong economy in 2 years without VY. I also think that all this conflict and controversy over VY is draining our community's resources (including time and energy) much more than we realize, and if we shut it down on the sooner side, those resources will also be able to go toward making our economy and our community stronger. A compromise I might suggest about jobs is for Vermont Yankee to transition to some other business after it is decommissioned as a nuclear plant. Perhaps it could be a combination of an energy-producing plant (other technologies- solar, geothermal, hydroelectric, wind, etc) and a technical college where sustainable energy technologies are taught, with internships on site. Perhaps there could be development and manufacturing of equipment for homeowners on site as well- solar panels, small windmills and so on. Perhaps there could be a research department for developing new technologies. Perhaps there could be a gym on site with aerobic exercise machines that put energy onto the grid, that members of the public could go contribute to as "volunteers" whenever they want. Perhaps this technical college would have an aquatic ecology department, studying the river. Perhaps some former VY employees could be retrained into other technologies and/or teaching, and kept around, if they want. I think the community's relationship with VY is of the same nature as an abusive relationship between individuals. The community is being abused, but many of us think we "need" VY for financial (economic) reasons! (Sounds like the same plight as many battered women!) This is not the case. We can be a strong community and a strong economy without VY. We will be stronger. The energy freed up by not being in that relationship will be immense and we can do it. We are not dependent.